Great as a stand alone benefit denial technique, or combined with electronic article surveillance technology, Alpha's bottle security products provide a tough, reusable and easy to use method of securing high-theft wine and spirits, as well as RX bottles. EAS compatible bottle security products are available with either Radio Frequency (Checkpoint) or Acusto Magnetic (Sensormatic) compatible detection. 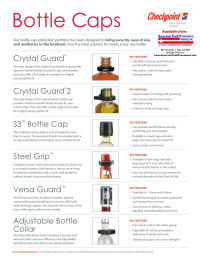 Click on the image to download information on Alpha Bottle Protection Products from American Theft Prevention Products. Call American Theft Prevention Products at 866-416-0999 to discuss the range of options available to protect your expensive liquor products. Small, sleek protection fits more than 90% of bottles.